goal of the game. Martin had 3 points on the night. 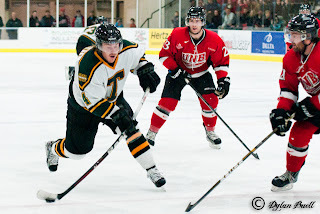 In the best game I have personally watched the STU Men's Tommies play all season long, the UPEI Panthers took the lead late in the game to win 4-3. This hands the Tommies their 13th loss of the season but by no means something they should hang their heads in shame for. The guys played hard from beginning to end with a short bench, missing from tonight's lineup were forwards Randy Cameron #17, John MacDonald #11, Alexandre Leduc #7 and the pair of D-Men, Christian Morin #2 and rookie Jordan Thomas #6. A notable stand-in on the Tommies injury riddled bench was Yuri Cheremetiev #9 on the defensive line. The full-time forward spent the night on the blue line and played very well out of his regular position. Yuri did have a wardrobe malfunction though at the 11 minute mark in the third period. Cheremetiev was noticed hobbling off the ice, he was missing a skate blade which took him out of the game until 3:27 mark very late in the game when team trainer Patrick Carmichael had the stand-in blueliner back on the ice. The first period had the Tommies pouring on early pressure against the UPEI Panthers although the shots on goal did not represent that. The Panthers held the Tommies to 8 shots to their own 15 on Tommies goalkeeper Jonathan Groenheyde #31 he kept the Panthers at bay in the first though, by playing a shutout period. Stephen Sanza #23 missed some time in the first period due to an injury that seemed to catch him in the mouth keeping him on the bench for a few shifts while being patched up. Very late in the opening period with the game clock at 19:52 Colin Martin put one in the Panthers net assisted by Sanza #23 and Robert Zandbeek #21 giving the Tommies their second game in a row where they jumped out to a 1-0 lead. The second period started off with the Panthers tying the game up with a power play goal with Alex Labonte in the penalty box at 1:23 in the frame, the goal was scored by Chris Desousa #28, assisted by Reggie Traccitto #95 and Dana Fraser #12. The Tommies though, not showing signs of giving up came right back with the skilled hands of Colin Martin planting his second goal of the night past Panthers goaltender Wayne Savage #1, the goal was assisted by Chris Morehouse #18 and Stephen Sanza. The Panthers managed to tie up the game on another goal from Chris Desousa with help from Dana Fraser getting his second of three assists on the night as well as Jordan Knox #9. At the end of the second period the Panthers lead the shots on goal 31-24. The third period started off in the Tommies favour with UPEI going a man down late in the second period with Zach McCullough in the penalty box on a hooking call. The Tommies kept the Panthers in their own end for the power play but were unable to go ahead with the man advantage. Shortly after the power play was over UPEI scored their first go ahead goal of the game, on a goal from Tyler Brown #26 with assists from Jordan Mayer #83 and Matthew Brenton #57. St. Thomas though not to be left out came back with the tying goal at 8:11 on a fast play by Stephen Sanza, assisted by Colin Martin with his third point of the game and Chris Morehouse. The Tommies were unable though to hold the Panthers off for one last goal scored by Jordan Knox on his second point of the game scored at 11:32 in the final frame. 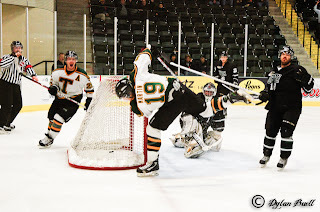 The Tommies pulled Groenheyde with two minutes left but were unable to get the tying goal by the time the buzzer called for the end of the game. The final score of the game 4-3 UPEI, with Jonathan Groenheyde turning away 38 of 42 shots for the STU Tommies at the other end of the rink UPEI's Wayne Savage #1 was able to post the win for the Panthers after having stopped 32 of STU's 35 shots on goal. As said earlier in the post the Tommies have nothing to be ashamed of, the team is starting to hit their stride from this fans perspective and is very excited by the teams upcoming games against the Saint Marys Huskies and the St. FX X-Men. They will be the last games before the first half of the season comes to an end and the team gets ready for exams and Christmas break. No good news to report this evening for the men. They drop a 4 - 0 decision to Saint Mary's. Justin Collier got the start in net tonight and stopped 30 of 34 shots. STU actually out shot the Huskies in the first period 11 - 9 but once SMU scored at 13:16 of the second period the wheels completely fell off. Final shots on goal were 36 - 21. St. Thomas has not led a game for one second this season and now find themselves at 0 - 12. The Tommies are falling fast folks and it isn't pretty. Is there a parachute anywhere to be found?? The St-FX X-Men and Women were both too much for St. Thomas teams tonight as the X-Men won 4 to 1 and the X-Women held on for a 4 to 3 win. Tonight's home game for the women was in support of Hailey's Dreams and Fredericton fans showed their support. Over 700 people came out to the Grant-Harvey Centre and over $3000 was raised for this incredible young Lady. As I watched her come out to drop the ceremonial first puck my only wish was that she wasn't sick, so young. I could also tell you that I was able to hold back my tears but I couldn't, I was so proud and sad at the same time. Please take a moment and check out Hailey's Dreams on line. In tonight's game the Tommies took the lead in the first to fire up the crowd but the X-Women rattled off the next 4 goals. STU came back in the third with two goals in the third but couldn't find the tying marker. 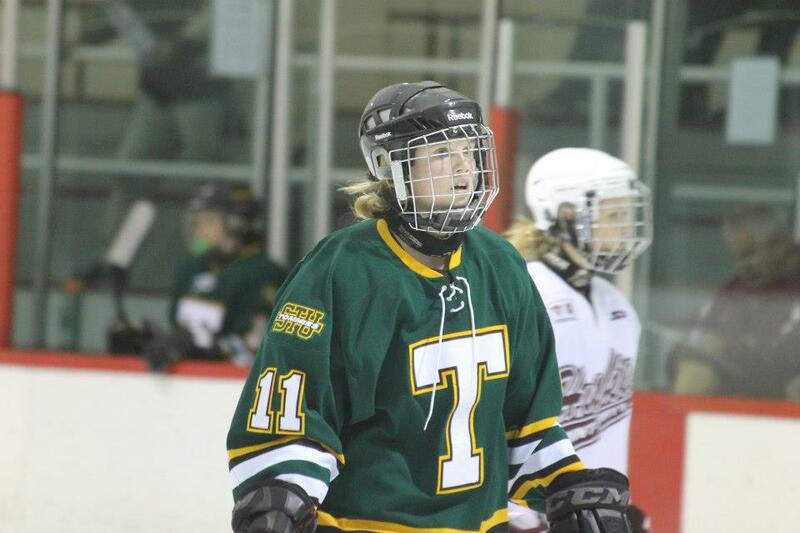 Scoring for the Tommies were Amy Duffield, Cassidy McTaggart, and Jenna Scott. In Antigonish, the men tied the game early in the second on a Jonathan Bonneau goal but the X-Men scored three in the second period and held on for a 4 to 1 win. STU outshot the X-Men 26 to 20 and 16 to 2 in the third period. Despite a solid comeback effort in the third period, the Tommies fell 3-2 to Les Aigles Bleus tonight at the Grant-Harvey Centre, leaving STU still searching for their first win of the season, falling to 0-10. The teams played to a scoreless draw in the first period, with Moncton outshooting St. Thomas by a 10-8 margin. UdeM opened the scoring at 7:46 of the second period, with Mathieu Bolduc's point shot deflecting past STU goaltender Justin Collier. Alex Quesnel scored on the powerplay at 9:16 to make it 2-0, then Marc-Andre Cote scored a shorthanded breakaway goal at 18:30 to increase Moncton's lead to 3-0. Les Aigles outshot the Tommies 17-12 in the middle frame. The play shifted in St. Thomas' favour in the third, and Stephen Sanza (Chris Morehouse, Colin Martin) combined to put the Tommies on the board at 3:36 after Sanza converted a nice Morehouse touch pass from behind the net. Despite some solid pressure and a strong forecheck throughout the period, it wasn't until 17:42 that Felix-Antoine Poulin (Martin, John MacDonald) batted the puck out of the air and behind UdeM goalie Andre Guay to make it 3-2. 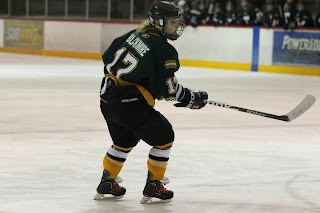 With Collier on the bench for an extra attacker, the Tommies had a couple of good opportunities but could not find the equalizer and les Aigles escaped their first visit to the GHC with two points. STU outshot Moncton 13-5 in the final period. 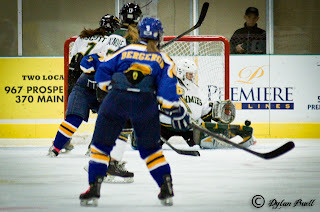 33-32 were the final shots on goal in favour of UdeM. afternoon against the Mount Allison Mounties. Chalk up another win for the Lady Tommies. Back stopped by a 20 save performance by Kristin Wolfe, STU vaulted into sole possession of first place in the AUS with a 2 to 1 victory over the Mount Allison Mounties. 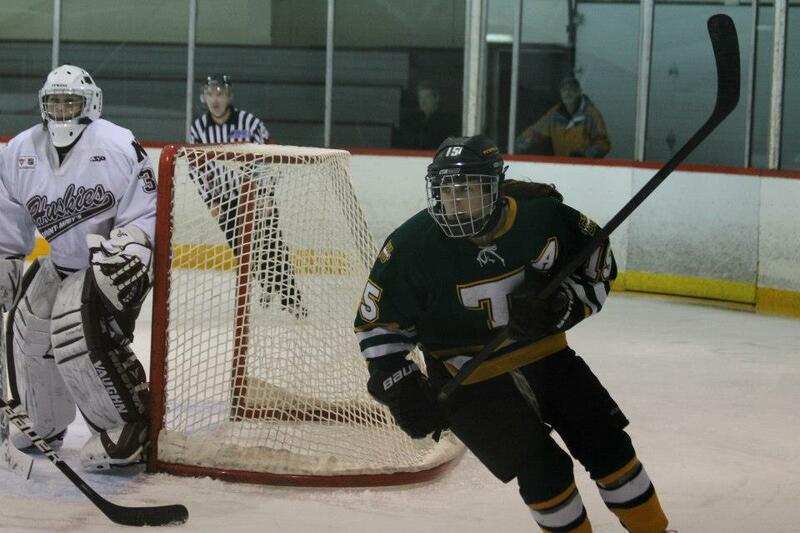 St. Thomas did all of their goal scoring in the first period. Kayla Blackmore scored her fifth goal of the season on a partial breakaway unassisted. Blackmore muscled through the MT A. defender to beat all-star goalie Meagan Corley-Byrne at 3:46. Sophomore Erin MacIsaac would get the eventual game winning goal at 15:16. Once again the goal was unassisted. Shots were 14 to 8 in the period for STU. The second period was scoreless with the Tommies holding the shot advantage 11 to 8 and both goalies playing well. In the third, MT. A would "mount" a comeback as Samantha Bujold would score at 7:40 but STU and Wolfe would shut the door to any further damage. Shots were 10 - 5 in favour of the Tommies and 35 to 21 overall. STU is struggling on the powerplay going 0 for 3 with the advantage today. The Tommies can't seem to get the PP going well. St. Thomas is playing very disciplined hockey, only taking one penalty today. Yes, they were perfect on the PK, killing off MT A's only opportunity. The Tommies will not see action again until next Sunday afternoon when the Dalhousie Tigers pay their first visit to the Grant-Harvey Centre. Come on out and watch the Lady Tommies fight for first place. I was happy to see at least 4 or 5 regulars to men's games at yesterdays Lady's game. Remember that your season's pass to the men's games is also good for the Lady Tommies. Get the biggest bang for your bucks and come on out next Sunday afternoon and support St. Thomas Hockey. 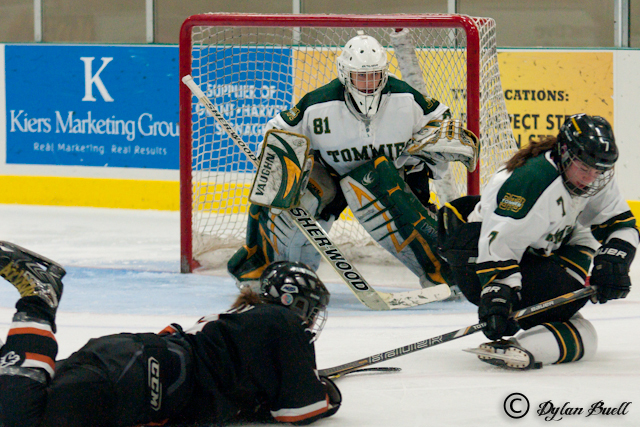 The Tommies lost tonight to Acadia 3 to 2 but something changed. Unless you watched tonight’s game you won’t know quite what I mean but the Tommies found something they hadn’t been able to find all season, some confidence. After making the game close, STU looked like a different team but they did look like a TEAM. The first period saw Acadia heavily out shoot the Tommies 19 – 2 but the margin was deceiving as STU played a structured system keeping the Axemen to the perimeter. The Axemen came out flying early in the second and their hard work paid off as Joe Gaynor banged home a loose puck 52 seconds into the period. A few minutes later an Acadia forward was left all alone in front of the STU net but Justin Collier made an incredible pad save to rob the Axemen. Unfortunately for STU the one goal deficit became two goals at 11:58 as Brett Thompson skated down the left side and snapped one blocker side past Collier. Acadia dominated the shot clock 20 – 6 in the period. The Tommies had no answer early in the third period and Acadia scored at 2:19 when Mike Cazzola was left all alone at the side of the net to pot an easy one. STU looked beat but Felix-Antoine Poulin (Reich, Henegan) would bank one in off of Peter DiSalvo to reduce the lead to two at 8:38. Then Jonathan Bonneau (Sanza, Levesque) would snipe one top corner at 11:42 to breath new life into the entire team. They had been out shot 46 to 11 up until that point but a whole different group appeared on the ice and while the come back did fall short, perhaps a change is in the making. Final shots on goal were 49 to 17 for Acadia. Justin Collier was outstanding in the STU net.